Van Moustache are Rafa Torres and Paul Laborda, a Sevillano duo inspired by the music of Django Reinhardt, a French gypsy widely regarded as one of the all time great jazz swing guitarists. Having lost the use of the third and fourth fingers of his left hand in a fire at the age of 18, he developed a unique style of playing. He was active throughout the 1920s and 30s, mostly as a member of the Quintette du Hot Club de France with jazz violinist Stephane Grappelli (claim to fame moment: I once met Mr Grappelli at a music festival in Canada many many years ago). Here you can see Van Moustache playing live at the veoapartment Christmas shindig at La Taberna de Pasos Largos in calle Feria. It was a fantastic night. 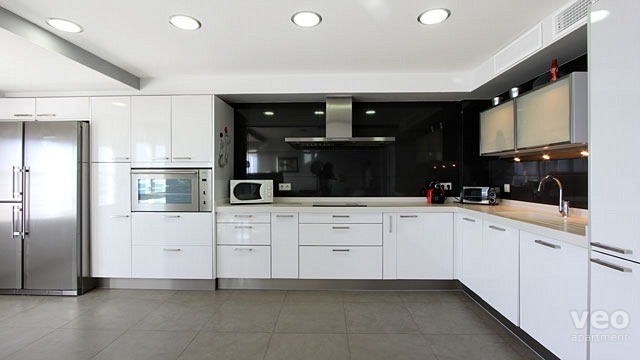 Over the last few years veoapartment has established a reputation as one of the leading holiday rental apartment providers for the major cities of Andalucia – Seville, Granada and Malaga. But now, for the first time, we are offering a superb beach front apartment for that perfect seaside holiday. 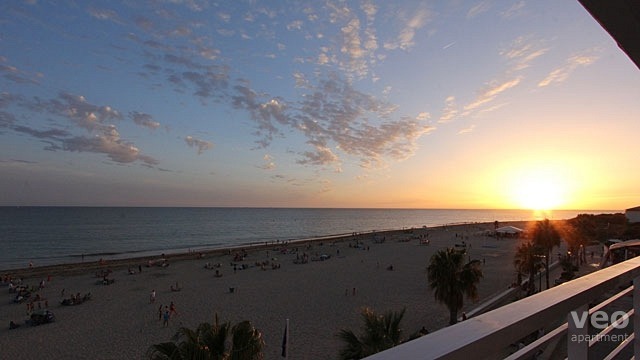 The Virgen del Mar Apartment is a fully equipped holiday home right on the beach in the resort town of Rota. With two bedrooms and two bathrooms it will accommodate four people in comfort. 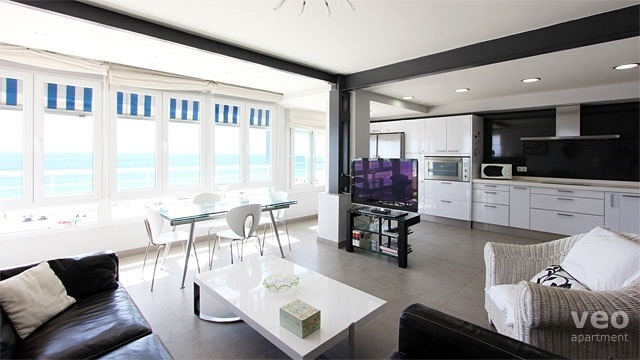 A large living-dining area with big picture windows that let in lots of light faces the beach, as does the L-shaped terrace, where you can enjoy a meal or a drink al fresco, or just enjoy the view across the bay to the ancient seaport of Cádiz. Although Rota is primarily a seaside resort, famous for its long stretches of sandy beach, its history goes back to Phoenician times, and something of that past can still be experienced in Rota’s old town. The mediaeval Castillo de Luna (Castle of the Moon), which is now the town hall and tourist information office, is well worth a visit, as are a number of religious buildings, particularly the parish church of Nuestra Señora de la Expectación, the church of San Roque and the tower of the Convent of Merced (though the convent itself no longer exists). 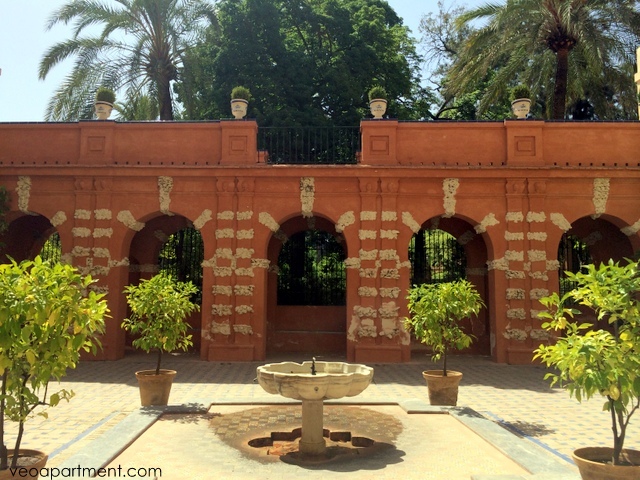 There’s a local museum, the Fundación Alcalde Zoilo Ruiz-Matos, and a botanical garden. Spend some time at the old Pesquero Astaroth fish market, and sample some of the local delicacies, such as Urta de la Roteña or Arranque Roteña (fish dishes made with freshly caught local fish), and the local red wine La Tintilla de Rota. For something more unusual the artificial fishing ponds of Los Corrales or the Bucarito pig and goat farm. Rota also makes a great base for visiting other nearby towns and attractions. The three sherry towns of Jerez, Puerta de Santa Maria and Sanlúcar de Barrameda are all close by, and for anyone interested in wines a visit to at least one of the bodegas is an absolute must. They are fascinating places, full of the aromas of sherry and the sherry making tradition. All three towns have picturesque old centres where you can get lost in the winding streets and little squares. It’s also possible to take a catamaran ferry to Cádiz, and spend a day in this fascinating old city. My favourite places are the market, with its spectacular display of fresh fish, the old fortifications and the botanical gardens, though there’s lots more. Be sure to grab a coffee or a drink in the Cafe Royalty in Plaza Candelaria. On the other side of the River Guadalquivir from Sanlucar is the famous Doñana National Park, the oldest national park in Europe, and an area of great natural beauty with its sand dunes, lagoons and woods. Also nearby is the Cadiz bay nature reserve, an area of wetlands in the inner part of the Bay of Cadiz, a fascinating though rather desolate landscape of marshes and abandoned salt pans. 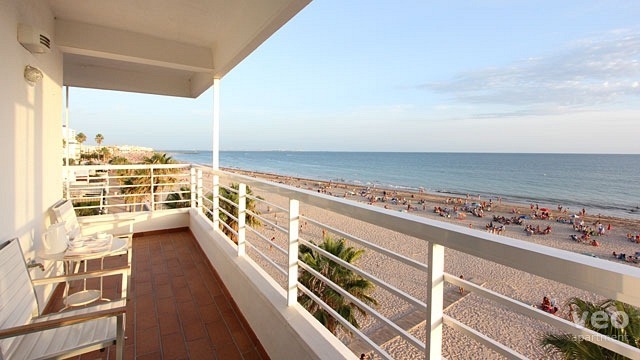 All in all, our Virgen del Mar apartment is a great location in any season to enjoy this very lively part of the the Costa de la Luz (coast of light). 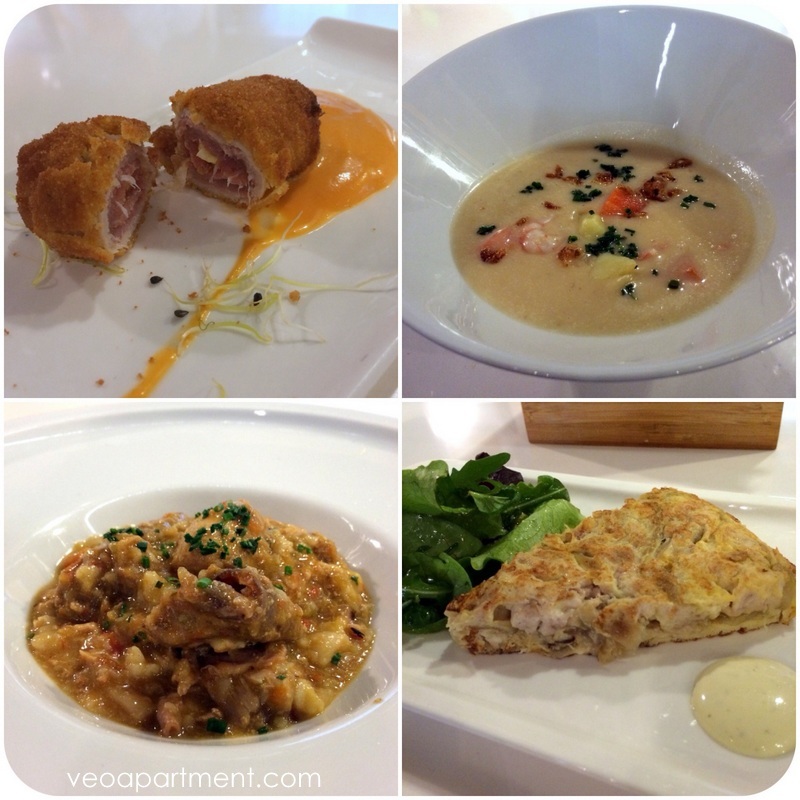 Here at veoapartment blog we pride ourselves on the invaluable information and advice about visiting Spain that we give our readers and guests, as well as all those insightful historical and cultural tidbits to help you understand what you’re seeing. We were just busily patting ourselves on our collective back when it occurred to us that we haven’t actually “done” the tourist thing for a while, and we should actually remind ourselves what it’s like to be a visitor. 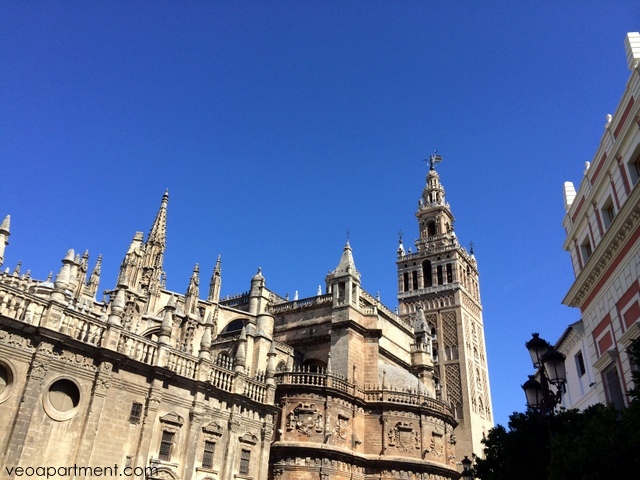 The obvious choice was to revisit Seville’s three main monuments, which are all UNESCO Heritage Sites: the Alcázar Royal Palace, the Cathedral and Giralda Tower and the Archivos de India. Despite the daunting prospect of being out of the office for several hours* a crack team of investigative reporters (myself and a colleague) was rapidly assembled, and we set off into the sunshine. Tip 1. The first thing a serious tourist needs is, of course, a good breakfast. We had ours at the excellent La Azotea Santa Cruz (coffee, ham and tomato on toast, and delicious fruit smoothies) in Mateos Gago, the street going up from the Plaza Virgen de los Reyes behind the Cathedral. For a more traditional coffee and tostada try the Horno San Buenaventura on Avenida de la Constitución, across from the Cathedral. Tip 2. There is often a long queue for tickets to the Cathedral. Avoid it by buying a combined ticket at the El Salvador church (worth having a quick look inside while you’re there too), which will allow you to by-pass the Cathedral queue. Tip 3. The Cathedral is normally open from 11am to 5 pm (last entrance 4.30), but closes early on Mondays (3.30 pm). It’s a working Cathedral so Sunday mornings it is not open for tourist visits. In the afternoons it’s open 2.30 to 6 pm. Fun Cathedral Facts: It’s the third largest church in the world, and the largest Gothic cathedral, as well as having the most ostentatious (sorry, biggest) gold altarpiece. The Giralda tower and the outer walls of the Patio de Naranjas (Courtyard of the Oranges) are from the Moorish period (12th century), the main body of the Cathedral is Gothic (15th century), the Royal Chapel and anything with bells in it is Renaissance (16th century), and the sections with rectangular windows are Barroque (17th century). It contains the tomb of Christopher Columbus (probably). Fun Cathedral Things to Do: Look in the angled mirror that allows you to look down at the vault of the cathedral roof. Play Hunt the Crocodile (yes, there is one – not alive fortunately). Climb the Tower. This is actually the most fun thing. It’s a ramp, not stairs, so it’s not too arduous, and you can look out of the windows on the way up and watch the city spreading out below you. The view from the top is worth the exertion. Tip 4. If you want to know more, get the audio guide. Tip 5. The Alcázar and the Cathedral is a lot to do in one sitting (allow 2 hours for the Alcazar and 1 for the Cathedral, but you may want longer), so either do them on successive days, or do lunch in between. We just had a cold beer, and it wasn’t really enough, but we weren’t on holiday, and you are, so don’t worry about the time. In summer do the Alcazar in the morning before it gets too hot. Opening times are 9.30 am – 5.00 pm (October – March), 9.30 am – 7.00 pm (April – September). Fun Alcazar Facts: Originally the site of a 9th century Moorish fortress, the oldest remaining parts – the outer walls and the Yesio Patio – date to the 11th century. The main palace was built by Peter the Cruel in the 14th century in the Mudejar style, and further additions and modifications continued through the Golden Age into the 17th century. 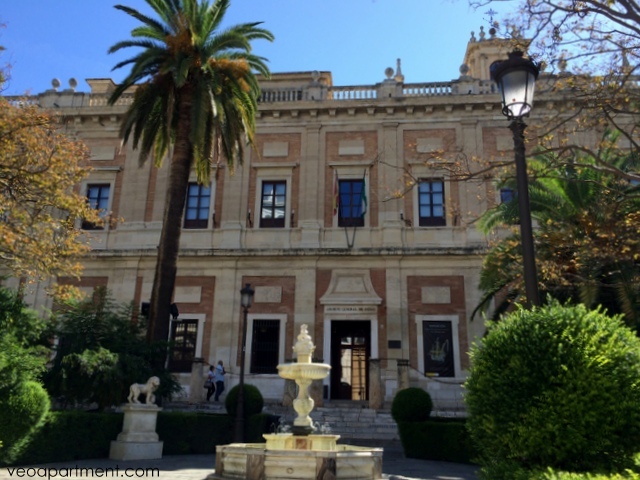 It’s the oldest Royal Palace in Europe and is still the official residence of the King of Spain in Seville. It’s shortly to be used for filming part of season 5 of “Game of Thrones”. 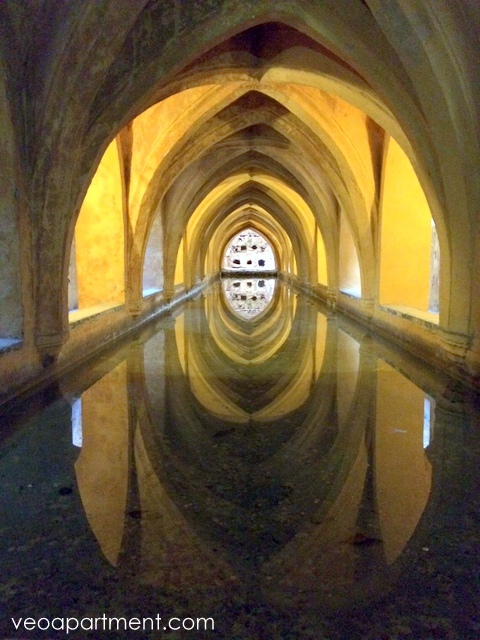 The Baths of Doña Maria de Padilla are actually rainwater tanks, but are still one of my favourite bits. Fun Alcazar Things to Do: Read the English translations of the information signs (can they really not afford a professional translator)? Although the Palace is awesome, the main fun things are in the gardens. Visit the maze, the Pool of Mercury (a fish pond with an airial fountain), and the Wall of Grotesques. Tip 6: Get a map (it’s surprisingly easy to get disoriented) and an audio guide, and remember to look up at the ceilings as well as horizontally at everything else. Our final stop was the Archivos de India, the big square building between the Cathedral and the Alcazar Palace. The document boxes are actually empty (the main archive is now across the street), but they give an idea of what the building looked like in use. You can see some of the old documents in display cabinets and there are often exhibitions, so check to see what’s on. When we were there it was hosting a gold and silver model of Columbus’s ship the Santa Maria. Admission is free. Opening times are 8.00 – 2.30 pm (Monday – Friday ). Fun Archivos Things to Do: Watch the little film about the history of the building, including its connection to the Americas’ trade (in Spanish with English subtitles). Fascinating. As in many historic Spanish cities, driving a car into the old centre of Granada can be quite a challenge. Private cars are forbidden to enter many of the central areas, or entry is restricted to residents, but even in areas where it is permitted you still need to be careful. Many of the main streets have a bus lane on the right, which you can’t use, and these are all watched on video cameras, so it’s very easy to get fined if you don’t know the neighbourhood. You then have the problem of finding parking for your car. Street parking isn’t really an option, as there are hardly any spaces, which leaves you with the two following possibilities. Public car parks are scarce in most residential and historic neighbourhoods, and also expensive, usually around 20 Euros a day. 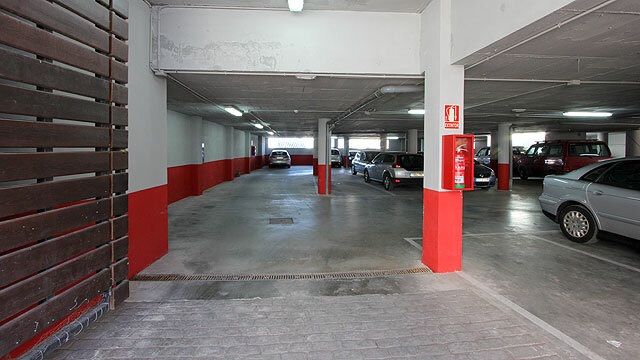 You should look up a list of Granada Car Parks before travelling and enter the address of your choice on your GPS navigating system, but even after arriving successfully there is no guarantee that there will be free spaces. The best option if you’re travelling by car, whether it’s your own or a rental, is to rent an apartment with onsite parking. 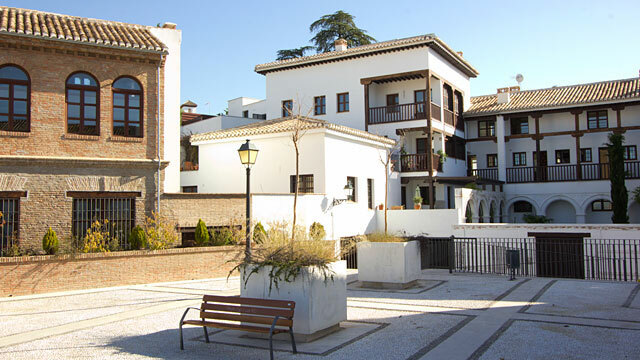 Our preferred apartments for this purpose are veoapartment San José, located in the lower Albaicín, which is close to both the Alhambra and Cathedral, as well as being an important historic neighbourhood. These apartments have a spacious underground parking area large enough to accommodate minivans, and with plenty of room to manouevre. An apartment with its own garage makes parking easy, and you can take your luggage up to your apartment in the elevator. 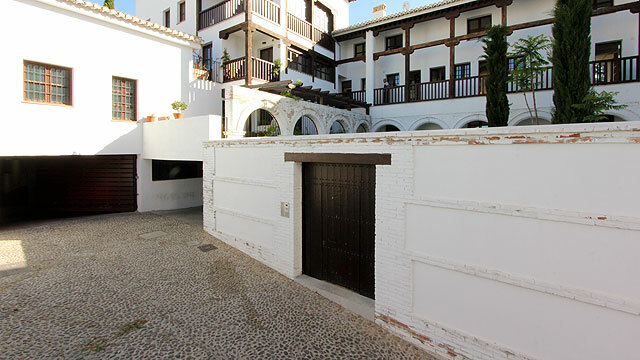 The San Jose complex has apartments of various sizes and price levels available, many of them with private terraces with views of the Alhambra or Cathedral. For example, 2-bedroom Veoapartment San José, with a terrace looking towards the Cathedral. The photos here show the apartment building in the square, and the entrance to the underground car park. When you do a search on the veoapartment website, apply the “Parking” filter to the search results. This will reduce the number of available apartments to those which have parking at the apartment. If you want to use the garage, just fill in the space on the online booking form when making your booking. 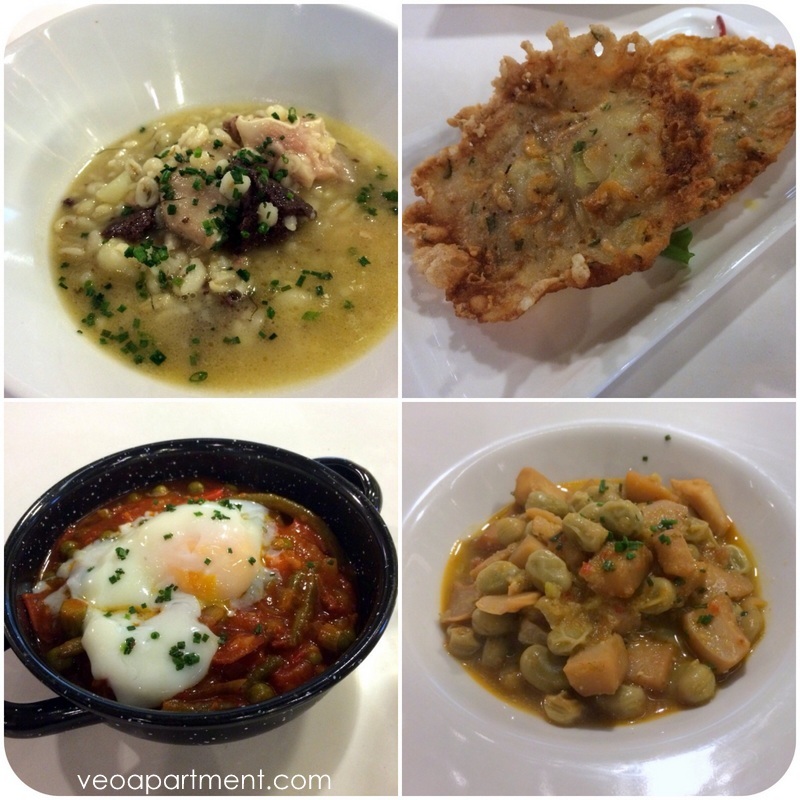 At veoapartment we like our fiestas as much as anyone and, as February 28 is Andalucia Day (marking the date of the referendum that gave Andalucia its Autonomous Region status), we thought we’d take the opportunity to treat ourselves to something special. As you all probably know, Andalucia is the southern region of Spain, famous for its sunshine, beaches, palm trees, flamenco and bullfighting. 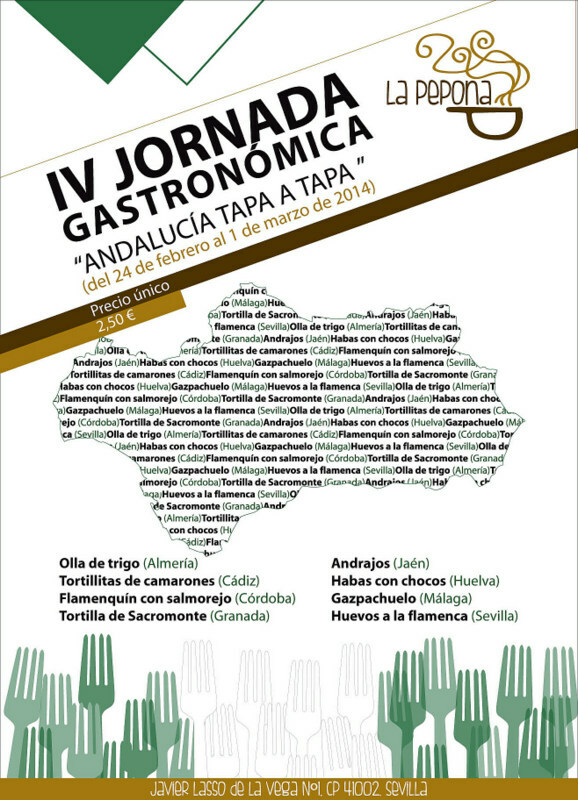 It is also the birthplace of the tapa, so what better way to celebrate than with an Andalucian tapas lunch? Luckily one of our favourite tapas bars, La Pepona, had a similar idea and is holding one of its regular gastronomic events this week. This one is in honour of Andalucia Day, featuring a traditional tapa from each of Andalucia’s eight provinces, a “tour de food” of the region without leaving Seville. And with the help of two serious professional eaters – @SVQconcierge and @SevillaTapas – we managed to visit every province. So if you’re in town this week we highly recommend stopping by La Pepona and trying some or all of these very special dishes priced at just 2.50€ each. Veo approved! As well as great food La Pepona has an exceptional wine list and lots of options by the glass. Ask front of house “show man” Juanlu to suggest something for you. Two for the price of one here. Flamenquin is ham and cheese rolled up in batter and fried, and salmorejo is the traditional Cordobes cold tomato soup. Thicker and creamier than gazpacho, it’s one of my favourite sauces. From the name you might expect this to be a tomato soup, but this is from Malaga, so it’s actually a fish and prawn based soup with potatoes and mayonnaise. Another of those really tasty dishes that the Spanish are able to cook up from very modest ingredients, in this case a bit of rabbit, some little flour cakes, in a vegetable sauce of onions, tomatoes, peppers, garlic and olive oil, and/or whatever else is at hand. Well, it’s an omelette, of course, but not the more typical Andalucian potato omelette. This local variant particularly features sweetbreads. For the less squeamish that’s sheeps brains. I hadn’t had this before, but it was actually rather good. Admittedly I wouldn’t have known it included brains if someone hadn’t told me. Literally a wheat pot. Another stew, this time of wheat, fleshed out (so to speak) with all those odd bits of pig that you have left over. Traditionally this includes the pig’s ear, which turned out to be quite tasty, though a little chewy. If you’re at all familiar with Spanish food you’ll already have tried these shrimp fritters, and experienced the crispy, crunchy goodness. And if you’ve tried them once you’ll probably be wanting some more. A tomato and pepper sauce/stew topped with poached eggs. One of those traditional winter warmers that never fails to hit the spot. And this is another warmer. A stew of broad beans with cuttlefish that sticks nicely to your sides.